Designing a bathroom offers the perfect opportunity to express your creativity. A large number of opportunities exist to customize your bathroom. You can customize the bathroom to express your own flair and personality. Here we will share some beautiful bathroom tile design tips to create an appealing retreat inside the house. Subway tile accents will always remain in trend since they are a versatile design option with a variety of patterns, colors, and materials. The tile design is timeless that won’t go out-of-date in the years ahead. You can add appeal to your bathroom by selecting subway tile accents that seem best to you. Consider using contrasting grout colors to increase the appeal of the tiles. White subway tiles accents with black grout colors can create a spacious feeling and look interesting as well. Large tiles can be used in both big and small bathrooms. In fact, large tiles installed in a small bathroom can make it look bigger. Apart from visual appeal, large tiles are also easier to clean due to fewer grout lines. You can elevate the elegance of your bathroom and also spend less time cleaning the tiles. Consider hexagon shaped bathroom tiles for your Huntsville custom homes project. The tiles will add a visual appeal to make the bathroom look cozy and inviting. The hexagon shape will add an exciting geometry to the walls and floors of the bathroom. You should select neutral color hex tiles for maximum appeal. Glass mosaic accents can add shine, color, and class to your bathroom. You can use the accent tiles for recessed shelf, shower, or backsplash. A colorful framed, stripe accent can break up the monotonous look of the all-white tile. Contrasting the shape and color of the wall tile is a great way to improve the appeal of the bathroom. A great way to add visual interest in the bathroom is to install diagonal pattern tiles. You can lay the glossy, subtle subway tile in a herringbone pattern. This will provide a refreshing appeal to the bathroom. You can also experiment with different diagonal pattern designs. However, make sure that you plan your design ahead to avoid mistakes. Consider installing border tiles to add style to your bathroom. A border tile can also add a bold statement without breaking the budget. You can add colored glass or mosaic tiles along the subway tile. Also, you can let it stand distinct against a painted wall. Bright colors can add to the visual appeal to the bathroom. But you shouldn’t overdo it. You need to balance the bright or dark color with neutral and white color for the perfect rule. Also, don’t consider this rule to be set in stone. You can go for all-neutral tile color like mixing white with grey for the best look. You should play with different colors until you get a color that looks best for your bathroom. You can also go for many other bathroom tile designs to spruce up the appeal of the space. Consider sculptural tiles for the walls as they are appealing due to their unique texture. You can also select a different tile for the shower area to highlight the area. Your mind is the limit when it comes to bathroom tile design ideas. 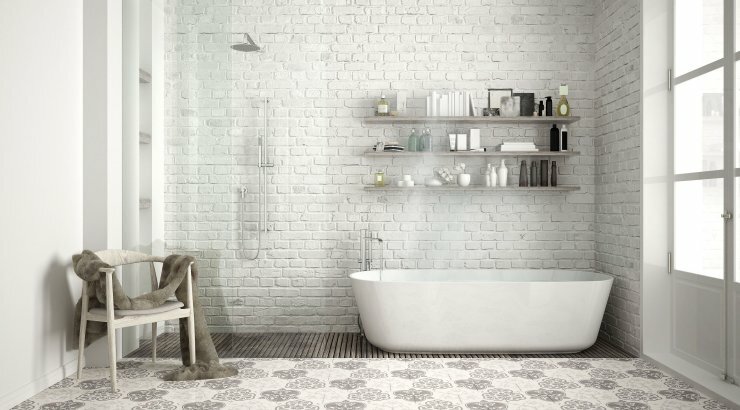 You can use different color and pattern tiles to create a unique design that looks one-of-a-kind.